Get the great effect of a decorated shot glass. 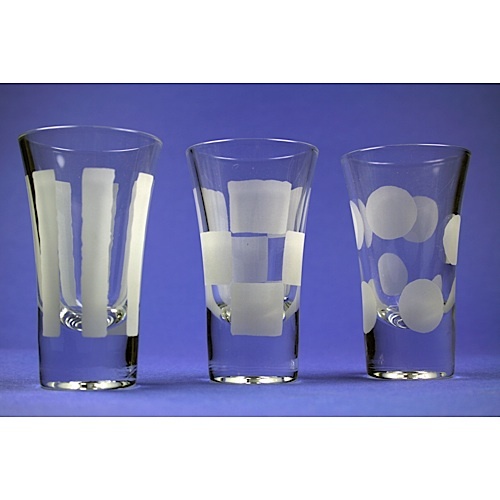 Using Armour Etch Cream, decals, stickers and other materials you can design your own shot glasses from Etchworld Armour. Great for having company. Wash & dry glass in hot soapy water prior to applying stencil. Cut a piece of vinyl masking slightly longer and wider than the length & circumference of your glass. Wrap the piece of vinyl masking completely around glass, applying and smoothing in one direction as you go, leaving no gaps or air bubbles. This may be easier to do if you lay the glass down on its side on a thick, folded towel. Trim masking at the top & bottom. With a pencil or marker, draw horizontal & vertical for the stripes or broken squares. Stickers can be used as a templete to cut the circles. Cut out one stripe or block at a time and peel away a section. This will be the part that will be etched. Take a piece of paper and lay over remaining masking. Take a popsicle stick, letter opener or old credit card and rub over the paper to smooth down the vinyl. Examine every strip of masking remaining and make sure every edge is tight to the glass. The better the masking is bonded to the glass, the better your results will beEtch the glass with your preferred method. If you are using the Etch cream, do not apply the cream on the stripes like your painting (straight strokes). It will come out streaky and blotchy. Instead, pat the cream on randomly with the sponge brush, going back around to fill in any spaces until every spot of glass is covered. Rinse glass under warm, running water until all cream or sand is off the glass. Remove masking and rinse again.